Self-realization means recognizing and knowing your self, the Self, or the nature of Reality. All of these are the same. On the cusp of the 10th and 11th centuries, the Kashmiri scholar and siddha Abhinavagupta was living and practicing in a super-abundant landscape of ancient Tantrik lineages gathered in what is now Kashmir and Pakistan. Abhinavagupta wove together a number of these strands of traditional Tantra to form what we call Kashmir or Trika Shaivism. The essence of the practice of Kashmir Shaivism can be approached through the Sanskrit phrase: pratyaksha darshana. Pratyaksha darshana means to discover for yourself, to see for yourself, and to see directly. Another way of translating this would be direct realization. Kashmir Shaivism values direct experience over belief and faith. It is more of a spiritual technology—a set of practices that help you to see how things are for yourself—rather than a religion. What is the view of Kashmir Shaivism? We live in, are created by, and are made of a single, continuous, alive and totally awake subjectivity. This alive, aware reality is available to be directly discovered by us in every circumstance because it is our own real nature. In other words, beingness or existence itself, is awareness. 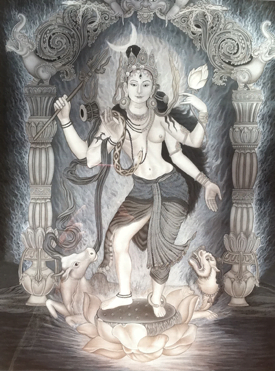 The appearing of an objective world occurs within this subjectivity due to its own creative activity, personified as Shakti. The diverse manifestations of life are celebrated in Kashmir Shaivism. In some traditions, the manifest world is thought to be degraded or dirty or sinful. Kashmir Shaivite adepts refer to our world and all worlds as ornaments of God or as the glamor or magical appearings of God. Our sense of separation is the source of our suffering. Once we are consciously immersed in living presence, seeing the wisdom in all that is, we can enjoy the diversity of life. In Kashmir Shaivism, the myriad productions of God have a fundamentally aesthetic, self-expressive nature. As we wake up more, we also become more freely expressive. Ultimately, we discover that that everything is made of and expressive of a playful and vast intelligence, a vast compassion, utterly devotional and operating with unimaginable responsivity and clarity. The Supreme Self is totally free to express itself and enjoy its own nature. Manifest life is a no-holds-barred conversation of Self with Self. Nature’s conversation is multi-dimensional and infinite. Practices such as mantra, kriya yoga, meditation, and working with an accomplished teacher erode our sense of separateness and subtilize our senses. Over time, we become more aware of and sensitive to our continuity with the pervasive Self and its call and response playfulness. As our body, energy, and mind wake up, we regain our capacity for embodying natural wisdom virtues such as creativity, compassion, wonder, and devotion. We become more skillful players in life’s tender game. 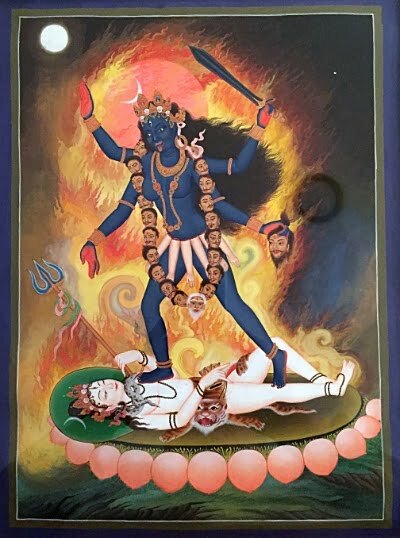 While some descriptions of the fruit of Tantrik spiritual practice emphasize experiences of energy and special powers, the ultimate nature of reality is wisdom. From the start of your journey until you realize that there was never a journey after all, it is the advent of direct understanding of Self and the embodiment of wisdom virtues such as clarity and compassion that should be your beacon. “Abhinavagupta’s Fifteen Verses of Wisdom,” Self Realization in Kashmir Shaivism: The Oral Teachings of Swami Lakshmanjoo, John Hughes, SUNY P, 1994.